BBC Radio 5 live - Football Daily, Liverpool’s title hopes dashed by derby draw & should Spurs sell Kane? 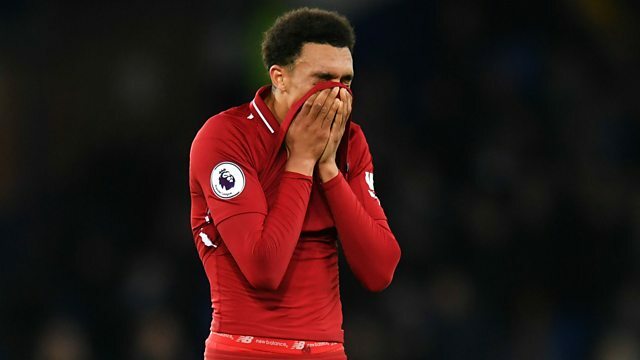 Liverpool’s title hopes dashed by derby draw & should Spurs sell Kane? Jonathan Overend is joined by former Liverpool defender Stephen Warnock, former Everton and Chelsea winger Pat Nevin and former Nottingham Forest midfielder Andy Reid to analyse the Merseyside derby. Manchester City are top of the Premier League after Liverpool were forced to settle for a 0-0 draw with Everton on Sunday. The team dissect Chelsea’s 2-1 win over Fulham and Leicester sinking to a 2-1 defeat to Watford in Brendan Rodgers’ first game in charge of the Foxes. And after Tottenham drew 1-1 with Arsenal in the North London derby, Andy Reid asks the question no one else in the studio was thinking – should Spurs sell Harry Kane?